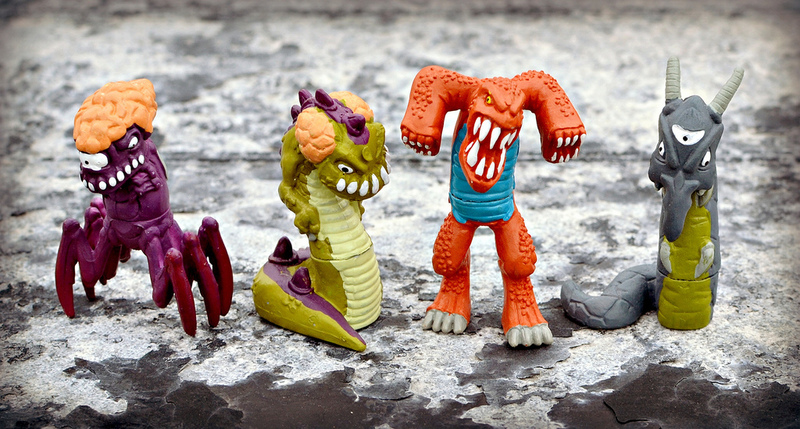 WHAT: Here's a great toy line from a few years back that I wasn't familiar with until very recently when TwoHeadedBoy was kind enough to send me some. I loved them as soon as I saw them. I'm not sure whether or not they were available in the U.S., but I don't recall ever seeing them in stores here. What line produced the bizarro creatures you see above? Alien Magic! 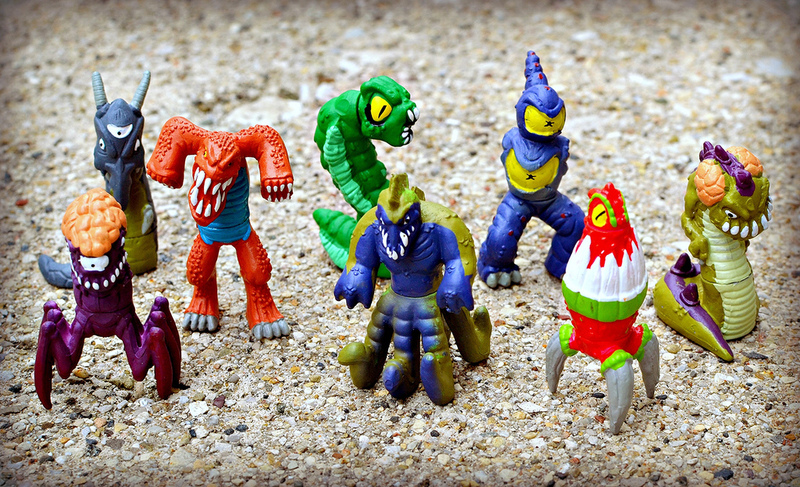 Alien Magic toys were released by Moose as one of their "Fizz and Find" properties, which included eggs you'd dissolve in water to reveal little plastic toy parts you could then put together to form mini figures. Other Fizz and Find lines included Dino Magic and Dragon Magic. The concept sort of reminds me of Galoob's old Trash Bag Bunch line of the early 1990s, in that you'd have to drop an outer container in water and watch it fade away in order to find out which figure you got. You always wound up getting a lot of doubles, but at least it was a bit more exciting than just opening up a typical package. I had seen people talk about Dino Magic figures online, but the line never really appealed to me enough to get me to investigate further. Alien Magic is a different story, though. I love how crazy-looking these things are! 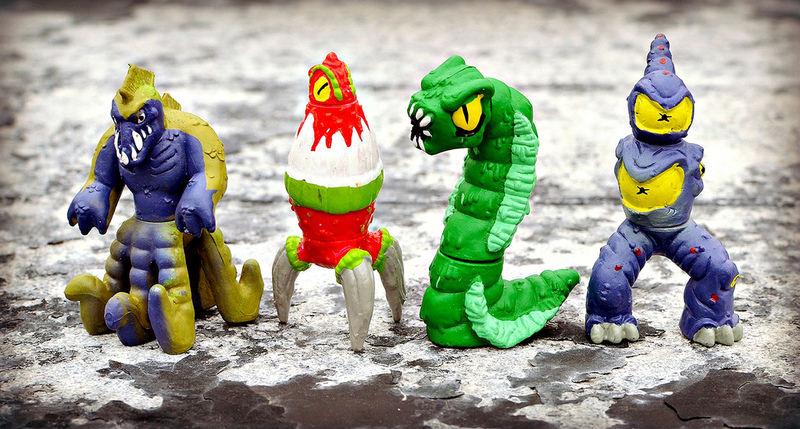 They are truly imaginative sculpts. 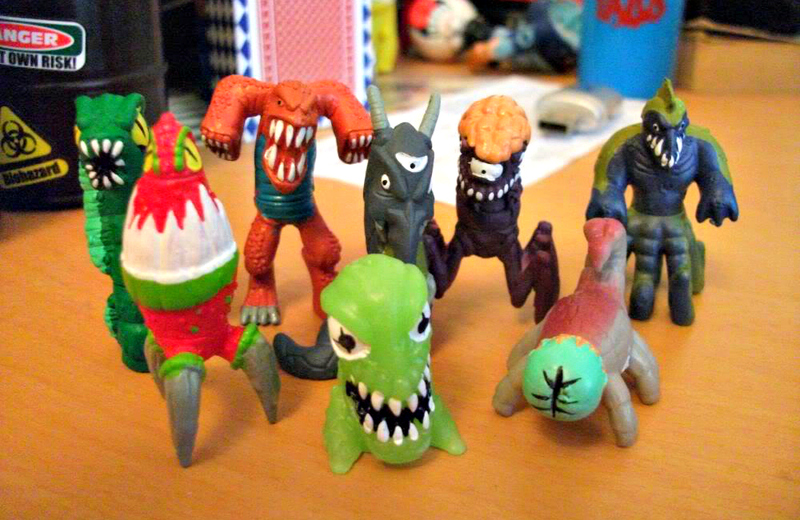 And I like how they don't look goofy or cutesy, like so many monster and alien-themed toys these days do. They look creepy and psychotic, which is usually how I like 'em. I think my favorites are the reddish-brown guy with the huge fangs and mouths on his arms, and the three-legged egg-like thing (seriously creepy). A big thanks to TwoHeadedBoy for introducing me to these and hooking me up with some! For more on Alien Magic, check out this thread on them at LittleRubberGuys.com. What do you think of Alien Magic? Do you have any or remember seeing them in stores? Does anyone have photos to share of additional sculpts not seen here? WHEN: According to information here, Alien Magic toys were originally available around 2007, and were still being sold at discount shops as late as 2011. Never saw those before, they're pretty cool! These are cool. Much better than the dino or dragon magic figures. Yeah, definitely the coolest and also probably the most obscure of all those Magic fizzing sets. Oh man, sad that this site seemed the only place that talk about this. Had that toothy orange and brainy purple guy, plus one gray octopus dude thats not in the picture. Was sold in Indonesia in 2004-2005 ish, Im searching online for the catalog and there are none, lol.